So after the merchandising disaster of the Motion Picture, the Star Trek property was kind of radioactive to toy makers. The sequel "Wrath of Khan" didn't see much merchandise save for some Dinky die-cast ships. 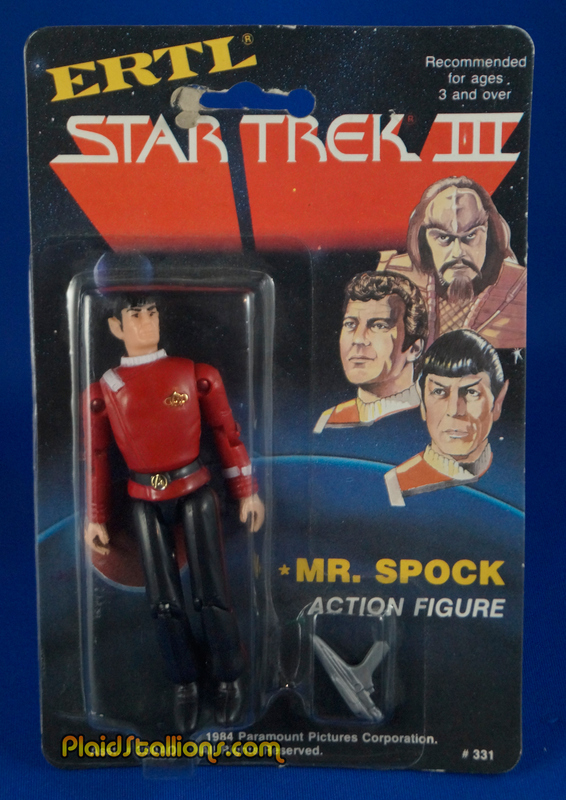 However, "Khan" was a hit and AMT/ERTL was selling lots of Star Trek related model kits and branching out into action figures, so they gave the next movie "The Search for Spock" a go. 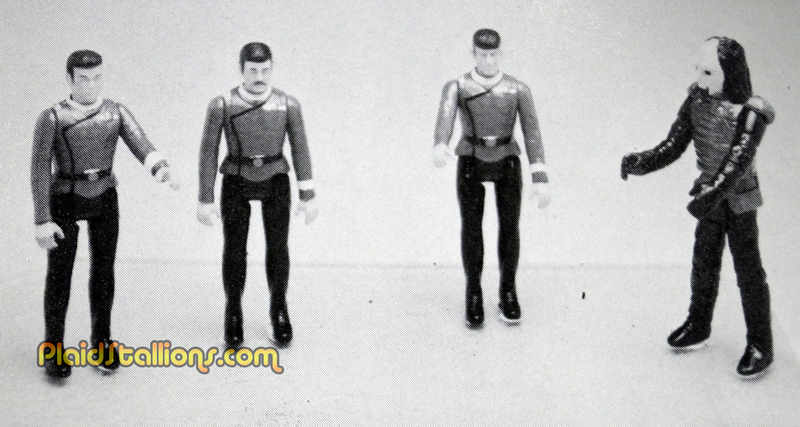 This is ERTL's press photo to the toy trade, it's kind of telling that they are just repainted Mego Star Trek the Motion Picture figures (not sure who Kruge is based on but i'm guessing possibly a Kenner Star Wars figure). There is a catalog shot which shows later prototypes with a Lassie like dog as a stand in for Kruge's pet. ERTL went all out with these and created O-Ring type figures popularized by Mego and Hasbro. These were actually well made but you occasionally saw them in stores having broken in the package. The nicely made figures suffered only in two regards, the accessories were too big (Seriously is that an ipad or a communicator with Kirk?) and the movie uniforms gave the figures a slightly generic look. A far cry from the explosion of colour the TV uniforms were. Also, Spock is NEVER in uniform in this movie! I just realized that. Scotty is another odd choice for the film as Dr. McCoy had a much larger part in the film. 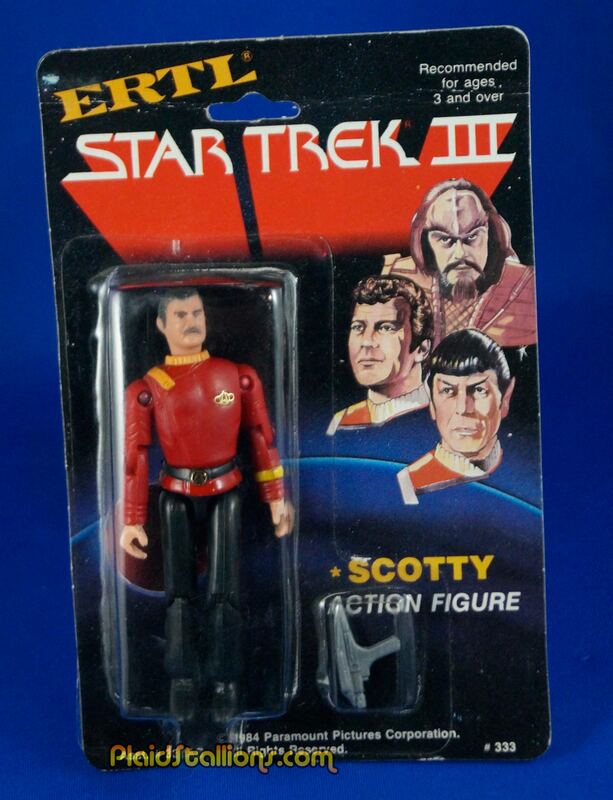 So, even though Star Trek 3 was a hit that summer, these figures were not. They languished on store shelves for years and were sold on clearance. I started collecting vintage SF toys in the summer of 1985, these were easily found for under a dollar and even though they were modern, they gave me a Mego vibe so i snapped them up. So why did they bomb? There are a number of factors as to why these didn't succeed. The first being that Star Trek was still a risky property after the Motion Picture fiasco. ERTL was also a manufacturer primarily known for die-cast toys and models, so they didn't get the presence on the action figure aisle like many competitors (I remember them mainly from grocery store cereal aisles). They used the same channels that they used to sell diecast cars, models and tractors. Edited to add: Since this article dropped i've gotten feedback that collectors only saw these at places like Farm Supply stores, hobby shops and Truck stops, not exactly the places you traditionally buy action figures. And lastly, 1984 was a super crowded year for action figures, you had returning winners like Masters of the Universe, Star Wars and GI Joe along with new choices like Power Lords, Super Powers, Lords of Light, Secret Wars, Man Tech, Go-Bots and Transformers. Star Trek merely was lost in the shuffle with all those brands vying for a kid's pocket money. It truly was the last time the original cast would be marketed to children. Galoob would try (and fail) with the cast of the Next Generation in 1988 but every time after this line that you'd see Kirk or Spock, the words "Limited Edition" would be stamped somewhere. Star Trek became about the adult collector. What's great about this is, they're well made toys that can be had for a song. I paid $99 for this set and I got the whole collection done in a shoe box, yay me! As a kid who actually played Star Trek in my back yard, this line will always have a place in my heart. I had the Enterprise and it was pretty solid. I would've loved these figures but I don't recall ever seeing them anywhere. The figures look really decent but what's up with the "art" on the packaging? If they had the license at least they could have had the STIII:TSFS poster art. 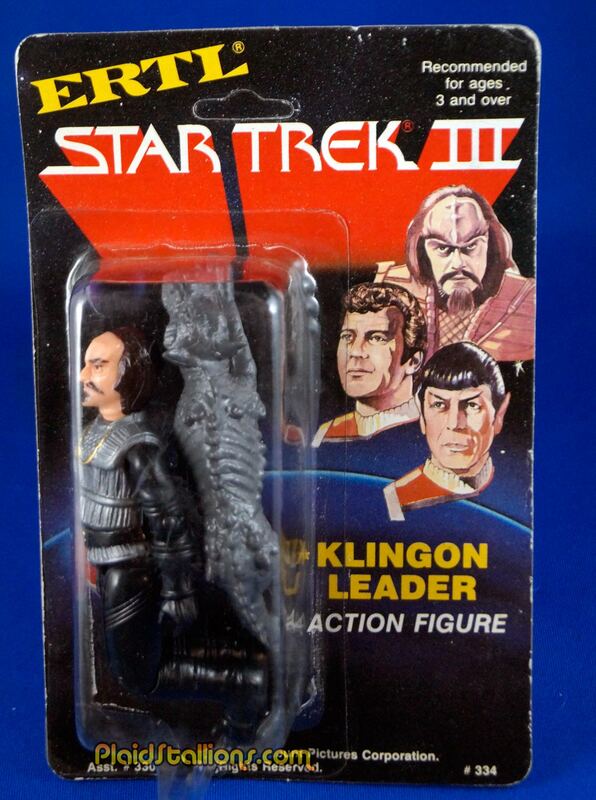 It's a shame about the Star Trek: the Motion Picture toys being a failure. I love mine and the movie. I even have two versions of it on home video. It's my favorite Star Trek movie and the only one I own. I don't watch or collect any Star Trek after that. 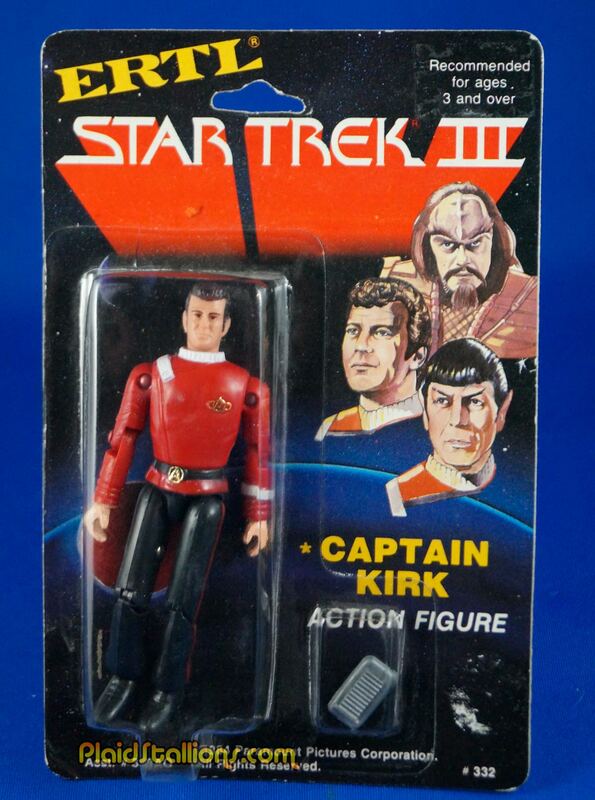 A number of times I've seen those Star trek III figures on Ebay and considered buying one. Maybe I will someday since they have a Mego look to them. The classic Star Trek series airs every day on TV. I'm watching it right now. That wonderful animated series airs on Sundays. The Kruge prototype to me looks like that the majority of the body may be a Kenner Biker Scout figure. It was released in the first waves of the 83' line so it would have been available to use by Ertl for early photos. I've always loved the 3 3/4' figures and these were ones I really wanted at the time. I thought of them as being more Wraith of Khan figures without the Khan. And the torso looks like it came from a Weequay figure. 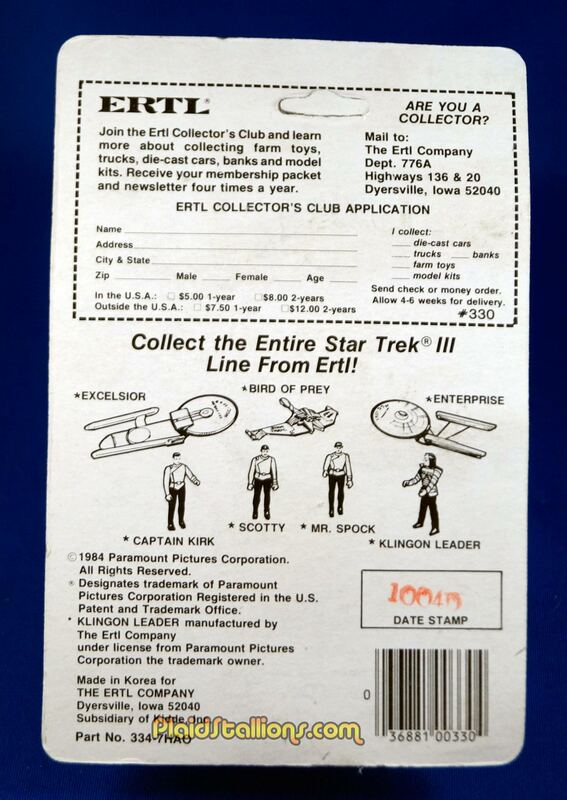 It also occurs to me that Kirk was an Admiral by the events of Star Trek III so the card is labeled wrong. Christopher Wesley - good call on spotting the Biker Scout bod for the Kruge - sorry, 'Klingon Leader' figure. I'd been racking my mind to identify that very familiar arm posture. I thought maybe Bespin Luke, but no. Bravo. Thought i may as well weigh in with a few memories - o-ring figures seemed like the very height of sophistication to my younger self in the mid eighties. The Trek III toys were rare as hen's teeth and much coveted. Get this - I don't think I saw them racked until 1989-90 when Toys 'R' Us (RIP?) opened in the UK, stuffed to the gills with thrillingly exotic remaindered items and oddities, which of course added immeasurably to the thrill of a weekend visit. Prior to this, they were the stuff of playground folklore - 'my cousin has a Star trek III Spock', or similar. On a pocket money budget, I never managed to get any of them, and they quickly vanished entirely, as did the Galoob Next Gen figures. They had plenty of Motion Picture Vulcan Shuttles and Klingon Cruisers too, the latter of which I did manage to acquire, for a bargain price.